When Takashi Amano first introduced Co2 into the planted aquarium, there needed to be a method of gently filtering the Co2 into the water. Without a steady way to get Co2 into the water column, growing aquatic plants was very difficult. From that, the Pollen Glass Co2 diffusers were invented, and the aquatic plants hobby has never been the same again! Every Pollen Glass diffuser is hand-crafted by Japanese glass makers. The glass used is thicker than that of other diffusers made in China, which means that there’s less of a possibility of breakage during use and the clean glass design makes it so that the equipment does not distract from the aquascape within. For Nano Aquariums less than 8 gallons (Cube Garden 30-C, Cube Garden Mini M, Cube Garden Mini S): Pollen Glass Mini. For 10-20 Gallon Aquariums (Cube Garden 45-P, Cube Garden 60-P): Pollen Glass, New Pollen Glass, Pollen Glass Type 2, Pollen Glass Type 3, Pollen Glass Large 20. For 20+ Gallons (Cube Garden 90-P, Cube Garden 120-P): Pollen Glass Large 20 (20-30 gallons), Pollen Glass Beetle 30 (30-50 gallons). 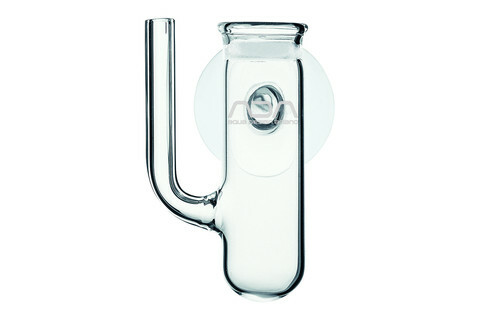 Comes with all of the accessory pieces necessary for a complete Co2 system. Clear coloration makes sure the appearance does not disturb the aquascape and fits in cleanly with the aesthetic of ADA glassware. Hand-crafted in Japan, Drop Checker is used to easily measure the amount of Co2 saturation in the water levels.